Three months have passed without any images worth posting. During that time I’ve had multiple problems with the telescope setup that I’ve just recently resolved—if I’m really lucky they will remain resolved. The first problem was an issue with the USB cables connecting the laptop to the cameras. DSI Pro/DSI II Pro cameras, at least with my laptop and hubs, like really short cables—anything longer than three feet between the hubs and the computer result in intermittent connection failures. The cables between the hubs and the camera must also be relatively short—anything over 6 feet and it is back to intermittent connection failures. My current configuration has a different powered hub for each camera, and no hub (regardless of whether or not the hub is connected to a camera) has more than one device attached. Any attempt to connect multiple devices to a hub also results in intermittent connection issues—even if the devices in question are two serial ports. The other major issue has been with my homemade stepper-based motorized focusing add-on. The first attempt used the 10:1 gearing built into the focuser to get an acceptable step size out of a 200 position stepper motor. Unfortunately the 10:1 unit slipped too much to be useful. The second attempt used an small geared stepper attached to the main focus shaft via two timing pulleys and a timing belt. Unfortunately the stepper was too small. The third attempt used a 50 oz-in geared stepper motor with the same attachment method as second attempt. This is currently working reasonably well, although I do need to increase the backlash compensation a bit. Lastly, I’ve been having problems with very elliptically shaped stars. The problem appears to be mostly resolved. I believe that it was due to the scope being incorrectly balanced. I still have a drift in the images that I believe is due to flexure in the focuser. Short of a new focuser I don’t have any good idea for fixing this issues, at least while leaving the ability to actually use the focuser as it was intended. Most likely a new focuser will eventually be purchased. 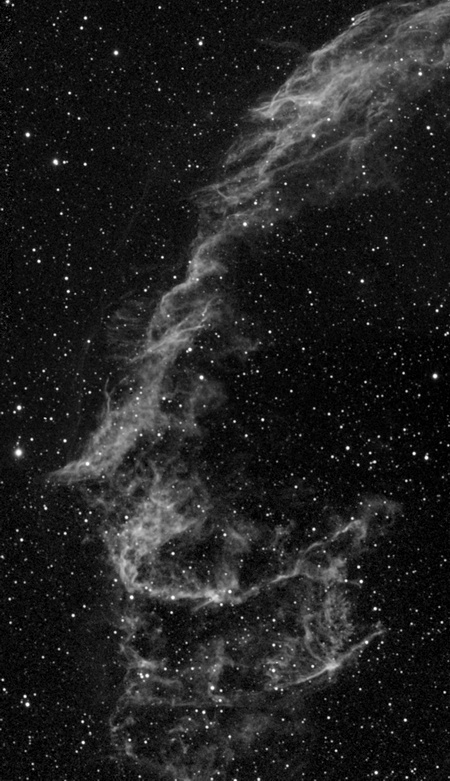 Below is an Ha filtered mosaic of the eastern portion of the Veil Nebula (NGC 6995) composed of three different images taken over two nights. Each image consists of about 18 10-minute subs. This entry was posted on Wednesday, July 23rd, 2008 at 10:14 pm	and is filed under Amateur Astronomy. You can follow any responses to this entry through the RSS 2.0 feed. Both comments and pings are currently closed.